S-class filtration - 99.9% Effective to 0.3 microns. We received requests to find a canister style vacuum that was portable enough to use as a handheld vacuum and powerful enough to extract pet hair from carpet. The Sebo Felix Premium is that canister vacuum! This vacuum comes with interchangeable vacuum heads to accomplish different tasks. The model we reviewed comes with a power brush head for carpet (brush motor can be turned off) and a parquet brush for hardwood floors. The Sebo Felix is made in Germany as are other Sebo models. The engineering and craftsmanship that go into Sebo vacuums are remarkable. The Felix is extremely portable and maneuverable. This vacuum should last for at least 10 to 15 years if well maintained, so don't let the price tag turn you off. Power! - The Sebo Felix 1 Premium comes with a very powerful 1300 watt main motor. The main motor provides the suction which is extremely powerful at 90 inches of water lift and 102 CFM airflow at the motor. If these numbers don't mean anything to you, don't worry, the Felix has more than enough suction to pull pet hair from deep pile carpet. Separate Brush Head Motor - The Sebo Felix 1 Premium comes with the ET-1, 175 Watt power head. This is an amazing vacuum head designed primarily for carpet. The power head comes with its own 175 watt motor to power the bristles. The motor can be turned off if you would like to use the power head on hardwood floors or delicate surfaces. Adjustable Vacuum Flow - This is one of our favorite features of the Sebo Felix. It has an adjustable vacuum flow control. The handle has a simple thumb slider than can regulate the suction. This is ideal for vacuuming delicate rugs, runners and drapes. Intelligent Suction Sensor - The power head has an intelligent suction sensor and height adjustment gauge. There is a amber light and a green light. If both lights are illuminated it means you need to lower the vacuum head (4 height levels) to increase floor contact and therefore cleaning power. If the green light glows it means you are achieving full cleaning capabilities. If the amber light illuminates it means you need to raise the vacuum head or there is a clog. The intelligent suction sensor technology will shut down the vacuum if there is a serious clog. Super Easy Clog Removal - The Sebo Felix 1 Premium power head removes effortlessly. To clean the roller brush you simply flip over the vacuum head and push ONE button to release the roller. In addition to the one click roller release there is an easy access door to remove clogs in the vacuum head. 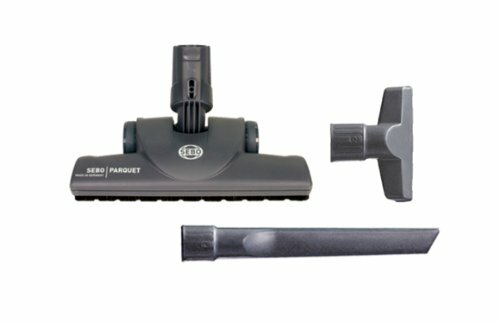 Parquet Brush Head - This model of Sebo Felix 1 Premium comes with a parquet brush head for hardwood floors. It is extremely light and contains natural bristles that gently move to accommodate floor undulations. This brush is ideal for cleaning hard floor surfaces. Combined with the lay flat feature of the Felix and maneuverability, you can clean nearly any area of a hardwood floor. 180 Degree Swivel Neck - This is one of many amazing features of the Sebo Felix. The neck that connects the vacuum head swivels a full 180 degrees. This allows the vacuum to maneuver through tight spaces. This feature makes the Felix more agile than the Dyson DC 25 Animal with ball technology, and it is MUCH lighter. Lay Flat Design - Due to the Felix's slim design and swivel neck technology (see above) the Felix Premium can fold flat to reach under furniture. When folded flat the Felix needs only 6 inches of clearance. Portable Canister Vacuum - This is the main point of any canister vacuum - portability. The Sebo Felix performs extremely well as an upright vacuum, but it excels at portability. The main vacuum canister quickly releases from the base giving you a relatively light weight, yet SUPER POWERFUL portable vacuum. It may not be as small and lightweight as some portable vacuums, but it is very powerful. In canister mode the Felix will thoroughly remove pet hair from stairs or other hard to reach places. S-Class Filtration - The Sebo Felix does require bags, but these are extremely efficient bags. The vacuum bags use electrostatic attraction technology to trap dust and pet dander. The bags are very large at nearly a gallon capacity and are constructed to have a huge surface area to prohibit loss of suction. Sebo vacuums use a 3 step filtration process. The S-Class, filter is equivalent to a HEPA filter that traps 99.97% of particles down to 0.3 microns. The air is further filtered through an exhaust filter that helps remove odors. Lifetime Belts and 5 Year Warranty - Sebo is one of the only vacuum manufacturers to offer a drive belt guarantee for the life of the vacuum. If you ever have a problem with the drive belt Sebo will replace it for free. All other vacuum parts are warranted for 5 years. Quality - If you read our Sebo X4 review you know that we are highly impressed with the quality of Sebo vacuums and the Sebo Felix is no different. This vacuum is extremely well built and engineered. If you are looking for a canister style pet hair vacuum then look no further than the Sebo Felix Premium. It is light weight (9lb to 15+lbs depending on attachments), and extremely maneuverable. This vacuum is actually much easier to maneuver than the Dyson DC25 Animal with ball technology. This model comes with the power brush head and the parquet hardwood floor head. In addition to the vacuum heads it comes with a crevice nozzle and upholstery nozzle that fit nicely in the base. There are some minor issues which are definitely not deal breakers and can be easily remedied. The Felix does not come with a dusting brush for blinds. You can purchase one separately, but we feel at this price point it should come with one. Additionally, the Felix has decent hose reach on its own, but there is an extended reach hose option available. There is a dusting brush, straight tube and extended hose 3 piece accessory kit that can be purchased separately. HIGHLY RECOMMENDED We think the Sebo Felix 1 Premium is one of the best canister pet hair vacuums available. Of course we haven't tested all available canister vacuums, but the Sebo Felix is well thought out and deserves serious consideration. If You Enjoyed Our SEBO Felix 1 Premium Review Please Share it With Your Social Networks!